Welcome to What’s Cooking Wednesday! It’s pasta again, folks, but I swear one of these weeks, we’ll go carb-free. I’ve been dying to slip a dessert in here, so perhaps next week. But there will probably still be flour. Oh well. If you have been searching for recipes for tuna, search no more…rigatoni with tuna is a super-easy, super-fast recipe so it’s perfect when you get home late but still want something homemade. I’ve been trying to convince P to let me make this for about a year and a half now as this was a staple of mine when I was single and cooking just for me. Well, apparently it was also his go-to dish, because he kept refusing the offer. He finally agreed to the tuna last week, and we’ve now had it two more times since then. 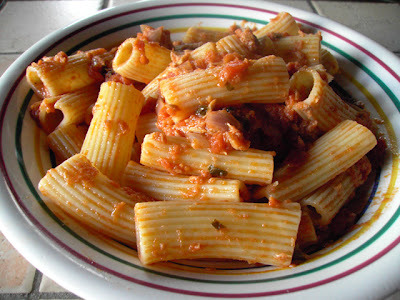 (1) I serve rigatoni with this because I like the way the grooves catch the sauce and the holes catch the tuna and tomato chunks. Most recipes I’ve seen, though, do this with regular old spaghetti; obviously that works too. (2) Many recipes for pasta with tuna don’t use onions. I don’t know why because I love tuna and onions together (especially on pizza! ), and I think they work well together here as well. That said, if you don’t happen to have an onion, feel free to do this recipe without it and double the garlic. Because many of you will have garlic and not onion, I’m sure. (3) This is a great recipe to switch up and add other ingredients you like–basil, black olives, and capers come to mind, but the possibilities are endless. First, put on the water for the pasta. By the time it’s boiling, your sauce should be about 10 minutes away from ready–perfect for rigatoni cooking time. Put olive oil in skillet and sauté onions on medium heat until translucent. Add garlic and peperoncino and cook for a few minutes, being careful not to burn the garlic. Add tuna and let cook a few minutes, mixing them well with the onions, garlic, and oil. Add tomatoes, parsley, and salt (at least a hefty pinch will be necessary), lower heat, and let simmer for about 20 minutes or until the tomatoes are cooked to your satisfaction. When your pasta is cooked and drained, mix well with the sauce. Serve hot and with grated Parmesan cheese if you like (even though purists would say no cheese with tuna). I’m a very recent convert to tuna so will definitely try this recipe. Thanks! I make mine similarly…occasionally with capers and a squeeze of lemon in place of the tomato. Oh man do I love it in a pinch. PS – NC prosecutor is in more trouble. Tracie and Gil, yes, cheese goes great with this, and, IMHO, on a shrimp risotto sometimes. But I guess I’m not *really* Italian, so don’t quote me. Annika, how could I forget to mention the black olives? I’m so impressed that your son’s an olive fiend! CJ, glad you’ve seen the light. If you can get fresh tuna, all the better! Christine, yummm, lemon and tuna–I bet parsley is picked up wonderfully in that combo. TOG, we eat so much fish and so much pasta here, it’s hard *not* to do them together. I’ll do a really simple linguini and clams in the future. Another 20 minute recipe (beat that Rachel Ray). Gil, yes, I saw about the prosecutor; will be interesting to follow. But snow? Are you kidding? I still haven’t even broken out my true winter jacket! They keep saying soon, though…. Ooooh this looks SO yummy! My mouth is watering just looking at it. I absolutely LOVE pasta – I could eat it every day of my life and nothing else ha ha. Actually, that’s what I currently do anyway *grins*.